The original building on this site was constructed around the year 1900, on land hewn out of the cliff face in Adelaide St below the big house previously owned by Dr Hobbs that had been used as our first Government House. It was a warehouse, subsequently acquired by Castlemaine Brewery in 1910. After the end of WWI, the company engaged architect TR Hall to adapt and improve the original construction. He was later to be involved with the design of City Hall. The renovated three-story building had very modern fittings and staff amenities, and further work was performed by Addison and Macdonald in 1930 and again in 1935. Castlemaine Perkins sold the building in 1985, but the handsome building remains occupied by a leading architectural firm, and my photograph (above) shows how it looks today. 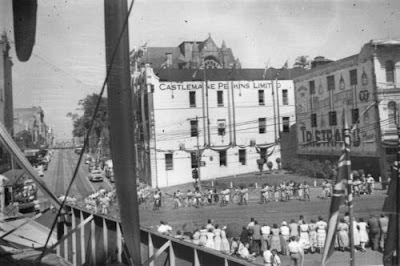 The date at the top of the building (1871) refers to the origins of the Castlemaine Perkins brewing business.